It’s no secret that Sherwood Park’s surrounding acreage area is some of the most sought-after real estate in Alberta. Finding the right place and price before it’s off the market is tough, and that’s on top of prepping and selling your own home, too. Best to do it like high school sweethearts Carmel and Ryan Giese, who bought their neighbour’s property after a serendipitous home showing. “We were driving home from the cabin, saw it was an open house and thought, oh, this is really nice,” Carmel says. The former owner was an architect who in the early ‘90s built the home on raised land just south of Sherwood Park, but with the pond, surrounding trees and shrubbery, it feels more like a high-end Canmore resort than a home in central Alberta. “Right away, the yard sold us,” Carmel says. But the stunning view and simple transaction didn’t mean the house was ready made for their family of five. They closed off a third of the attached garage to make ramps for their family’s wheelchair use, and built a second detached garage opposite it, which has a loft the kids use for floor hockey — when it’s too cold to play on the artificial rink (complete with boards) outside. “They still play in the house, too,” Carmel smiles. Inside needed renovating as well, and it took some navigating between what worked and what didn’t. They liked the exposed timber, but weren’t crazy about the maple trim. They kept the stone flooring, but got rid of the main-floor carpet. 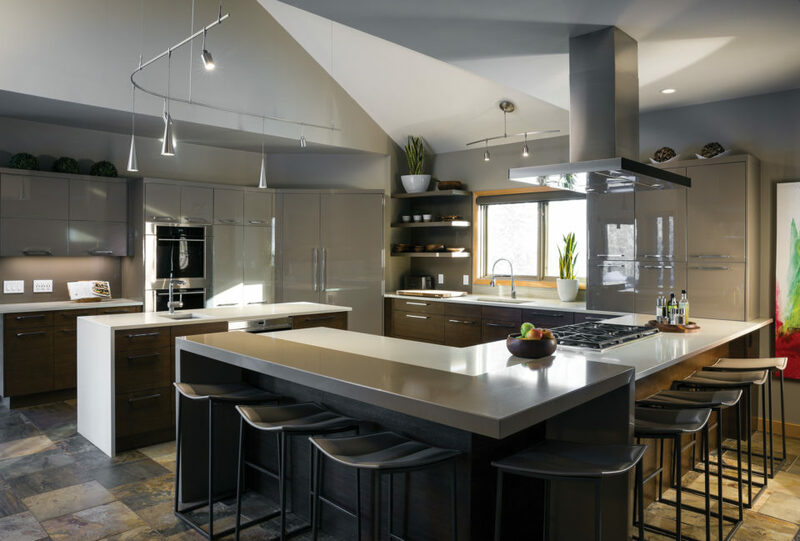 With a standard one-storey ceiling, the kitchen and joining living room could feel closed in, if it weren’t for the skylights and massive south windows facing the driveway and landscaping that light up at night. Carmel says the kitchen is the most used and “most important” room in the house, but it took a lot to get it right. “The kitchen was very dated, very heavy and chunky,” she says. “It had a C-shaped island with no seating, and we wanted lots of seating because we have three kids who have thousands of friends.” The Gieses eat most meals around the now L-shaped island, and spill into the living room for post-meal recovery and family time. With white countertops and the massive fridge blending in with the grey cabinets, it’s the most explicitly modern room in the house. But the stone floor and exposed wood furniture keeps it warm and casual, an extension of the family’s vibe. 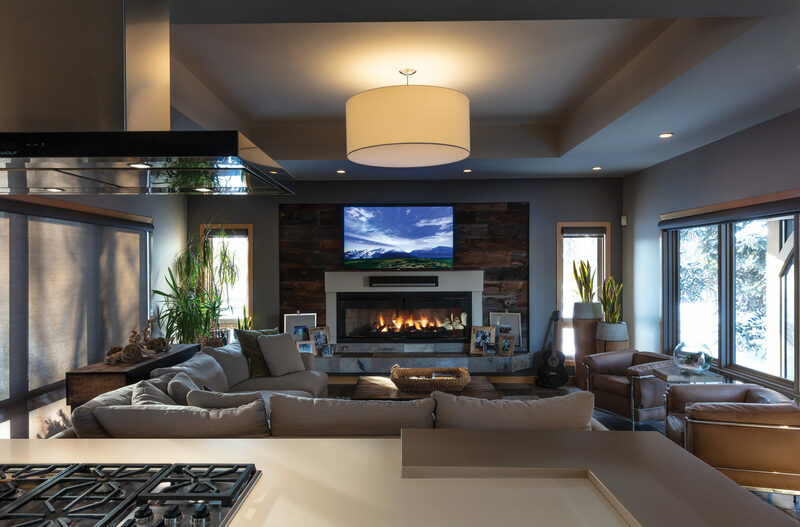 With its scenic surroundings and rustic interior, new additions and renovations (and more to come), the Gieses took an exquisite home and made it their own, inside and out. 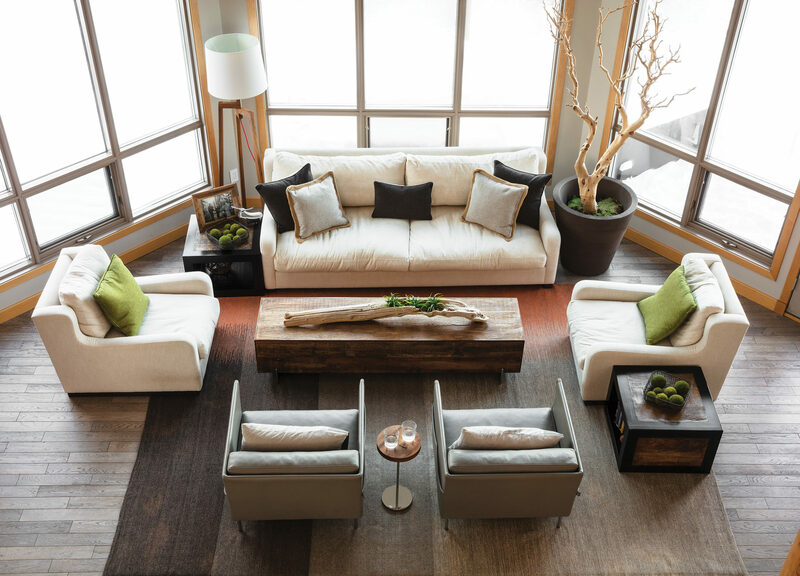 The result is a perfect mix of modern design with timeless cabin vibes, a home that could only look better among magnificent, snow-capped mountains. Not bad for a fortuitous open-house drive-by.